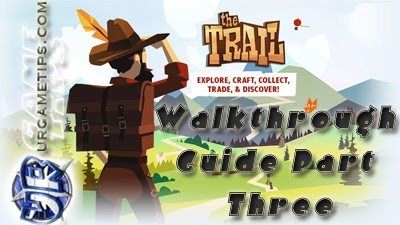 Here's the 3rd part of our quick walkthrough guide and tips for beginners playing "The Trail" (Android and iOS mobile game). - I recommend that you follow the 1st and 2nd part of our guide first for other tips that I will no longer mention here. - Depending on the recipes you currently have, choose the best option according to your preference. - You can also get the quest items from "Top Trader" Gifts, and Raccoon Drops. - If available, you can also buy them from other Traders, and as a free gift from the ad girl Annie. - Trader > Adventurer Pants Recipe (craft: farm materials from Pinecone Valley Region - Growing Camp > Green Meadows. Get an Upgraded Advanced Slingshot and some Hatchet for 2x drops too). - End of Part 3 Quick Walkthrough Guide Quest List. - Welcome to the new region where you will start to encounter new type of trees (Mesquite Trees) and animals like Boars. A whole new set of items and food can also be gathered from here on. Good Luck! - Use your Upgraded Advanced Slingshots to hunt Boars (4x Hits with 2x drops), or buy some Composite Slingshots (2x Hits) from camp sites around here. - The easiest way is to buy multiple Logger's Axe from traders around here, or if you feel lucky, just wait for someone to chop them down for you. - Apples are somewhat scarce here, so either buy them from other traders and continue crafting Cookies, or just use all of your Wheat Grasses for crafting Bread. Also buy some Wheat Grass from traders when you get the chance. - Continue and buy or gather Raw Meat and Rock Salt for your Jerky recipe. - Reminder: Watch out for your Food Weight, just carry around 30 Weight for now to avoid faster Stamina drain. - From here on, gather and save all Eggs that you encounter along the way (also drops from Mesquite trees), and from trading. Use them to craft Omelettes. Conserve your food because this is the last Food recipe that you can easily make. - Omelettes restores 4 Hearts by default. - You will also start to encounter these types of Food from trading, buy them if you want, then store them into your Private Chests for later use. - Peach Cakes and Sausages restores 5 Hearts by default. - Gather and save these items to easily complete some quests later on. - Save 15 Eggs for later (Flour Recipe quest). - Save 27 Cotton Fiber for later (Hitchhiker's Pack Recipe quest). - Save 5 Apples and 10 Wheat Grass for later (Peach Cake Recipe quest). - Save 5 Raw Meat and 10 Rock Salts for later (Sausages Recipe quest). - Save 27 Wheat Grass for later (Buffalo Pie Recipe quest). - Woodland Walk region still drops Turkey Feathers so Pilgrim Hats should still be your main source of Chits. More info and other options can be found here: How to Get or Farm Fast Chits with Toys and Hats. - Welcome to the Swamp region! - You can no longer find Turkey Feathers here, so if you still have lots, then that's perfect. - In case you are running out, just farm or buy them from other traders. - More info and other options can be found here: How to Get or Farm Fast Chits with Toys and Hats. - Once you reach this region, you should now be close on completing the Twine Recipe and Flour Recipe (All job paths at Lvl 12). - Just continue whenever you are ready. - Welcome to the Desert region! - At this point of the game, some of your quests will force you to go back and replay other regions to complete them. Follow my advice above on how and where to farm these quest items. - While doing your Upgraded Composite Slingshot Recipe, take your time and earn more Chits by crafting more Pilgrim Hats. Farm them from the Buffalo Range region: Yellow Steppe > Lavender Tor. - Save 40 Desert Rose for later (Master Trader Jacket Recipe quest). - Once you unlock these recipes, ignore them for now. Focus on your easy to craft Food recipes instead. If you followed my advice before, you should now have more than enough Food anyway. - Once you are done with the Sausages Recipe above, continue your journey and complete the remaining quests along the way. Craft or buy some tools and use them to chop Mesquite trees and hunt Boars.